DR. CALVIN DAY IS NOW SEEING PATIENTS AGAIN! 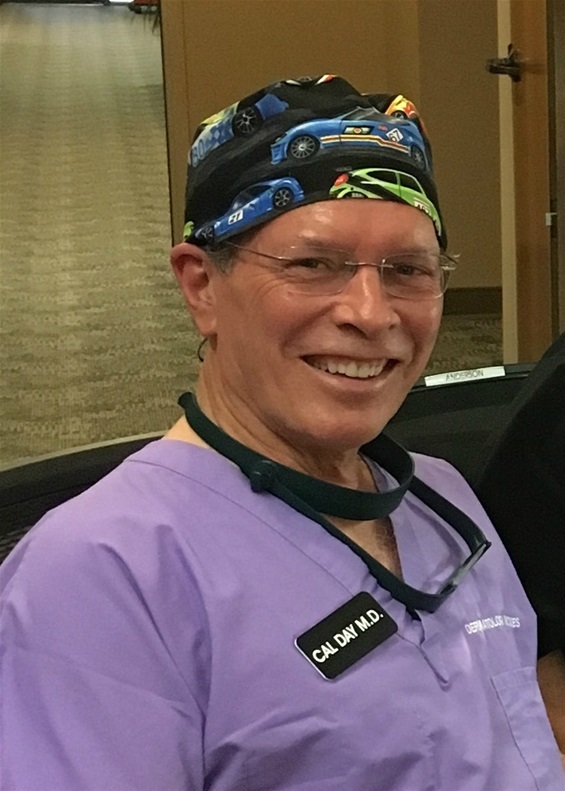 After a six-year absence, Dr. Cal Day resumed his dermatology practice on Monday September 25, 2017. Dr. Day’s services have been retained Dr. Terri J. Nutt, owner of “THE SKIN MD”, a group dermatology practice at 4432 Lockhill Selma, Shavano Park, TX 78249. Those interested in making an appointment to see Dr. Day should call “THE SKIN MD” at 210-615-9494. Dr. Day, who is a Harvard trained dermatologist, completed his “Return to Practice” training with Drs. Larry Anderson and William Grabski in Tyler Texas earlier this year and received high marks for his performance there. Prior to this Dr. Day had a private practice in San Antonio for 28 years from 1983-2011 and had an academic teaching position at the University of Texas Health Science Center in San Antonio where he was a Clinical Professor from 1990-2011 and the Director of Skin surgery for the Division of Dermatology from 1983-2000. Dr. Day published more than 60 articles on the topic of skin cancer and treated more than 26,000 skin cancers with the Mohs technique during his 28 years in practice. In 2011, Dr. Day’s license was “temporarily suspended” following allegations of sexual assault, but in December 2016, after the statute of limitations for perjury had elapsed, the woman confessed that she fabricated the allegation. At the time of his arrest for the allegations of the woman who eventually confessed, Dr. Day was shown in handcuffs on television to 900,000 viewers (Nielsen), and this televised “perp walk” precipitated medical board complaints from four of his 20,000 women patients and one of his former 376 women employees. In the 27 years prior to that time, Dr. Day had practiced complaint free despite having cared for approximately 40,000 patients including approximately 20,000 women. It was subsequently shown by either testimony or medical records or both that each of the four women patient complainants returned to see Dr. Day on a date after the date of the allegation which in and of itself makes their complaints not credible. Moreover, all of these complaints were filed on the heels of the televised perp walk and there were no complaints filed at the time of the alleged events that were alleged to have occurred years to decades earlier. Each of these four patients had prior grudges for unrelated issues. On 3/7/2017, the state court dismissed all charges against Dr. Day subject to an Agreed Order which had no adverse Findings of Fact regarding conduct. As a matter of standard legal practice, any “finding” concerning allegations that had been “determined” to be true would have been listed in the FOF of the AO; the absence in the FOF of the AO of any “finding” regarding conduct or patient harm means that there was NO "determination" that either of these had occurred. As a matter of law, Dr. Day had the default position of the presumption of innocence and Board staff had the burden of proof to prove otherwise but failed to do so, ergo by virtue of the State Court dismissal of all charges brought by TMB and by the absence of adverse conduct findings in the FOF of AO, the signing of the AO by the TMB president meant in effect that TMB members “agreed” that Dr. Day was innocent of and exonerated of all misconduct allegations. Dr. Day is elated to return to the profession that he loves! He is happy to be taking care of patients once again! 1)  Dr. Day’s principal accuser and the TMB legal staff’s witness in chief confessed that her allegation was a fabrication via an affidavit invoking her Fifth Amendment Right against self-incrimination in response to 69 separate allegations of perjury relative to Dr. Day’s case https://cis.soah.texas.gov/dmwebbasic/tokweb27.ASP?WCI=opendocument&SKEY=418639_0_9_63&localtimezone=300 – after clicking on this link, click on the tab that says “Search Public Case Files”. In civil law, as opposed to criminal law, taking the Fifth is tantamount to an answer of yes to each question. Accordingly, Dr. Day’s accuser’s Affidavit is an admission of guilt to all 69 questions propounded to her. In addition to submitting this affidavit, she made an outright confession of guilt to at least one credible confidant.